Andrew Franz‘s philosophy is that “design should inspire, incite compliment and celebrate our lives. It should serve our legacies and our relationship with the environment.” That philosophy is reflected in the renovation of this mid-century modern house, located upstate in Palisades, NY. 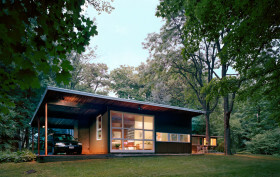 The remodeling of the home involved updating the wood floors, the exterior walls and the kitchen, and Andrew’s hand gave way to a design that’s modern, warm, and in touch with the picturesque forest surrounding it. In other words, the clients got the perfect vacation hideaway they were wishing for.